Mirroring (ha!) the previously mentioned Panasonic GH4 offer, you can also get a free Rode VideoMic Pro Compact Shotgun Microphone when you purchase the Sony a7S body only for its usual price of $2500 at B&H Photo and Adorama. If you are looking for both a Sony a7r body only and a tripod, B&H Photo is currently offering the Sony a7r body only for $2100 with free shipping with this free item included automatically by B&H, the Oben CT-3451 Carbon Fiber Tripod With BE-113T Ball Head. This promotion is good as long as you see it mentioned right below the product name at the B&H Photo website. The Panasonic GH4 body only kit remains at $1500 but it has more freebie options. At B&H Photo you get a free Rode VideoMic Pro Compact Shotgun Microphone. At Adorama, you get a free $50 gift certificate and 32GB SDHC or a free battery and 32GB SDHC and 4% promotional rewards. 4% of $1500 is a sizable amount = $60 to be used in a future purchase. The Samsung NX3000 with the 20-50mm kit lens is down to $330 with free shipping, in either the black or the white color configuration at Amazon by Amazon itself with a limit of two per customer. In parallel, the NX3000 w/16-50mm in black or white, almost matches Friday’s lightning deal price, it goes for $360 instead of $350… These are not part of the lightning deals. 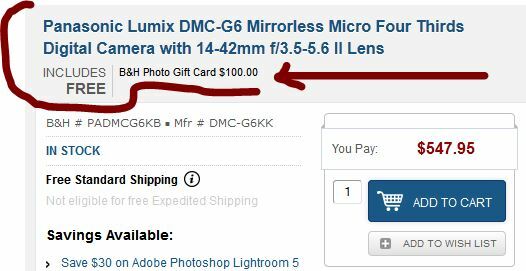 The Panasonic G6 with 14-42mm was going for $550 with a $100 B&H Photo gift card. That promotion expired, but now the price of the camera has dropped to $500 at various authorized Panasonic dealers, including Amazon itself (limit 2) and Adorama and B&H Photo. No free gift cards at the moment. This daily deal expired… Never a dull moment! The bonus deal of the day at the Amazon Gold Box is a sale on Samsung NX3000 with 16-50mm kits. Prices range from $350 to $360 depending on color/combination. Limit three of each option per customer. Offer ends by 3am ET on Sat 12/13/14 or earlier if sold out. The Panasonic G6 w/14-42mm II Lens is going for $550 with free shipping again at multiple authorized Panasonic dealers, but the listing at B&H Photo has a pleasant surprise: you also receive a $100 plastic B&H Photo gift card! The free gift card will be included automatically by B&H Photo while this promotion is running. While the promotion is running, this offer is mentioned right below the camera’s name. No free $100 gift card but you get a free Lowepro case, 32GB Transcend SDHC at Adorama, and no freebies at Amazon by Amazon itself (limit 2). The Panasonic GH3 body only is now going for $700 with free shipping at some authorized Panasonic dealers, including Adorama (free extra battery, 32GB SDHC, 16GB Memory Vault, 4% rewards) and B&H Photo (4% rewards) and Amazon by Amazon itself (limit 2; no extras)… This is now going for less than half the price of the GH4. 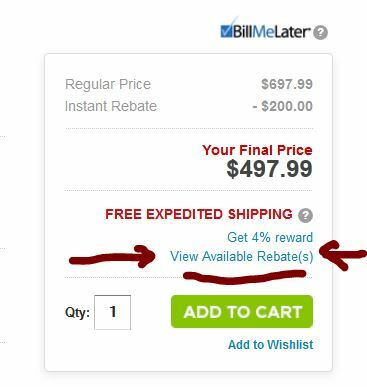 It also goes for $500 with free shipping at Amazon by Amazon itself (limit 2) but no promotional rewards and no double warranty via mail-in rebate. It is back! If you purchase the Olympus E-M10 with the 14-42mm lens at its standard price of $700, you will also receive the 40-150mm lens for free at the Olympus Store. The Premium E-M10 kits are also eligible for the free lens promotion ($925) price… The $700 sale price is also available at Amazon by Amazon itself (no limits). Amazon does not carry the Premium kits though. This 24-hour offer expired… A special surprise for M43rds fans this Cider Tuesday, the Olympus E-M10 two lens kit (14-42mm 2RK and 40-150mm F4.0-5.6 R) along with the Olympus OM-D messenger bag is on sale for $700 with free shipping at Amazon by Amazon itself. Essentially you are getting the 40-150mm lens for FREE! This is a limited time offer. This was one of the first deals we added to the Deals Situation Room and upon recheck, the price has dropped from $450 to $400. “It” refers to the manufacturer refurbished Sony NEX-5TL with 16-50 and 55-210 sold by Secondipity on eBay, with a limit of five per buyer. This limited time sale ended… Bundle time! BuyDig is offering the Sony Alpha a6000 w/16-50 & 55-210 Lenses and Lightroom 5 and $50 Gift Card for $750 with free shipping. Offer ends 12/7/14 or earlier if sold out… For more specials, check the BuyDig Cyber Monday pages. This Cyber Monday offer expired… The Cyber Monday deal from the official Olympus store is a 25% off sale on the Olympus Outlet Store with coupon code CYBER25 over there. The coupon expires 12/2/14 at 3am ET but supplies are limited, so items may sell out beforehand. Due to time constraints I cannot price-check everything in the Olympus Outlet store. Samsung’s first real flagship NX mirrorless cameras, the NX1 body only kit is now in-stock and ready to ship for $1500 with free 2-day shipping and 4% promotional rewards (= $60 rewards) at Adorama [corrected link! I accidentally “ate” a letter from the url]. This arrived in-stock earlier today… It is also in-stock for $2800 in the NX1 with 16-50mm f2-2.8 kit. Another hot deal at the eBay Deals! For $300 with free shipping you get the new condition Sony a5000 w/16-50mm and Lightroom 5 and 16GB SDHC from BuyDig’s eBay store (authorized Sony dealer). Available in black or silver. Limit 5 per buyer. This is a limited time offer of unknown expiration date. The Sony a5000 with the 16-50mm is now dropping to $300 at various authorized Sony dealers including B&H Photo and Adorama and BuyDig and various at Amazon. More eBay Deals action, you can get a new condition bundle from authorized Sony dealer BuyDig, Sony a6000 with 16-50mm and Adobe’s Lightroom 5 and 64GB card for $600 with free shipping. This is the standard price of the a6000 with 16-50mm, so you are essentially getting LR5 for free. Available in silver or black. You can see the bundles in pictures #1 and #2 in the eBay gallery. Limit 5 per buyer. UPDATE: if you don’t need 16-50mm lens and Lightroom 5, the Sony a6000 body only goes for $450 at Adorama and Amazon et al. If you want a more recent model instead of the previously mentioned a5000 w/16-50mm, for $350 with free shipping you can get the Sony a5100 body only at Adorama et al. Adorama has also launched their Black Friday specials on select Canon DSLRs and DSLR Lenses and Speedlites (flashes) and Fixed Lens Cameras. Free accessories and/or promotional rewards and/or mail-in rebates, and free shipping are included. Due to time constraints I cannot price check every item listed there, that is a DIY adventure for any item(s) you may be interested in. To the eBay Deals we return where Secondipity’s eBay store is offering the manufacturer refurbished Sony NEX-5TL two-lens kit (16-50, 55-210) for $450 with free shipping. Limit 5 per customer. Over 300 sold so far from this listing.